One of the The Largest Rug Looms . . .
SIDE 'A': Mr. Ali Nejad, president of Nejad Rugs (above, right), visits the site of one of the largest rug looms in the world - where the production of a magnificent hand knotted Persian Kashan carpet - one of the world's largest handmade wool rugs - is underway (approx. ½ complete). One of the The Largest Rug Looms in the World - Producing One of the Largest Rugs . . .
A rug loom of approximately 50 meters width, constructed in the city of Nishabour, Iran, is one of the largest rug looms in the world - capable of accommodating up to 60 weavers at any time on the work platform, about 5' above the ground. Mr Ali Nejad, president of Nejad Rugs appears in the photos (above r., below center) taken on location at the Iran Rug Company, Mashad, in Khorasan province. 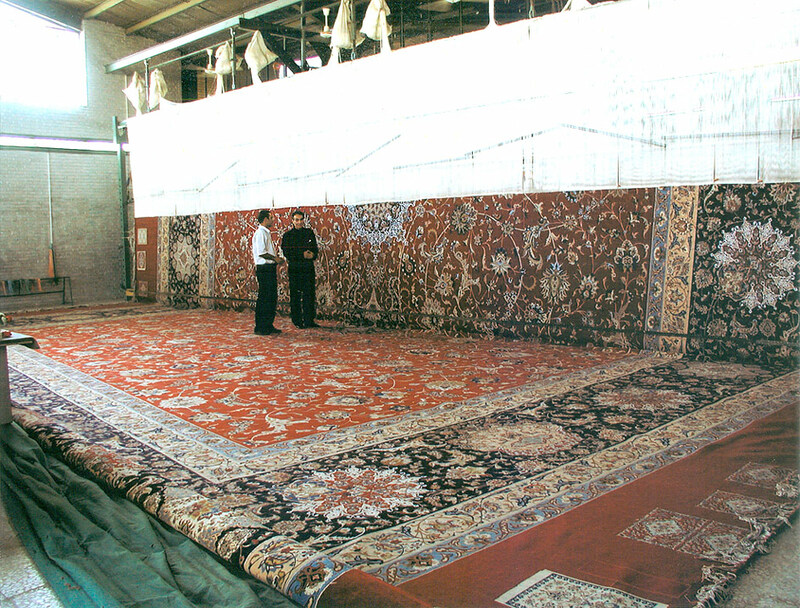 "The loom was province for our company since we are a major carpet producer in Iran. This loom, in terms of dimensions and its artistic composition, with adjustable length and 50 meters width is unique in Iran. It consists of two movable beams to which warps are attached, the complete work is rolled on to lower beam and makes it ideal for weaving very long rugs, also in some cases rugs are woven in series which could be perfect option for large orders of similar rugs with the same size and design." According to the company's sales manager Fereidoun Haghighi the loom is probably the largest in Iran. But, as he says to Jozan Magazine, we should not be surprised if we see larger ones in the future. 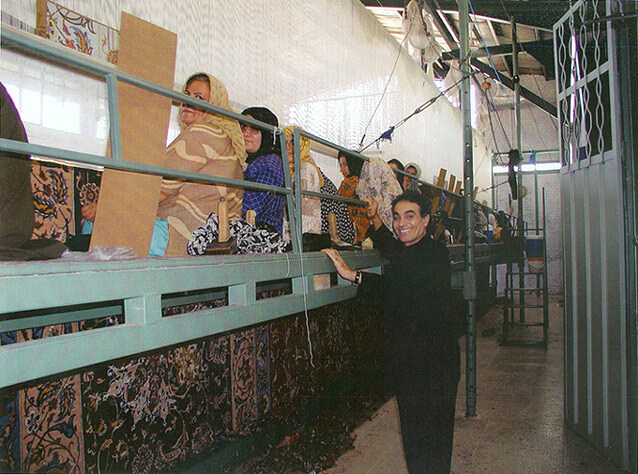 SIDE 'B': Nejad Rugs CEO Mr. Ali Nejad, examines the production site for one of the world's largest handmade wool rugs - where several carpet weavers, working in unison on an elevated loom platform, practice their time-honored art. The rug - with nearly 40 weavers working continually - required more than two years production time to complete. Only the most highly skilled weavers are selected for such a project.